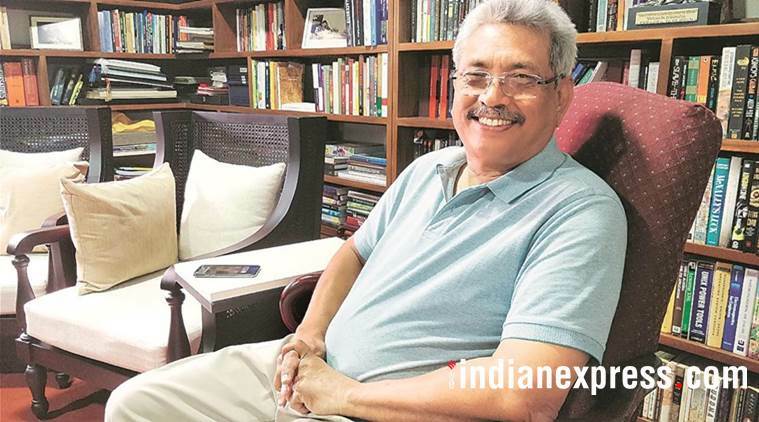 Los Angeles/Colombo, April 12 (DailyFT/Ada Derna/Newsin Asia): Former Defense Secretary Gotabaya Rajapaksa has dismissed the two lawsuits filed against him as “baseless” and insisted that the cases would only motivate him and his supporters to push for political change in Sri Lanka. On his arrival from the US on April 12, Gotabaya said that he had completed all formalities in regard to the renunciation of US citizenship. He is planning to contest the coming ri Lankan Presidential election as a candidate of the Sri Lanka Podujana Peramuna (SLPP) founded and headed by his brother and former President Mahinda Rajapaksa. To contest the election, as stipulated by the 19 th. Amendment of the constitution, he cannot be a dual citizen as he is till date. He has to renounce his US citizenship and be exclusively Sri Lankan. Commenting on the two law suits against him in the US alleging complicity in the torture of a Sri Lankan Tamil and in the murder of a Sri Lankan newspaper editor, Gotabaya Rajapaksa said that these lawsuits have been filed to delay the US citizenship renunciation process and discourage him from contesting. “I have handed the matter to my lawyers [in Los Angeles] to take care of and I’m looking ahead to what needs to be done for our country,” Gotabaya Rajapaksa said. He met with his attorneys in Los Angeles on Tuesday. The first step Rajapaksa’s attorneys will take is to determine if the lawsuits are within the statute of limitations. Depending on the type of case, California’s statutes of limitations range from one year to 10 years. The clock starts to click on the date of the incident or the date of discovery of the harmful action. Initially, they may also file a “demurrer,” which is essentially a pleading in state court to have the case dismissed, challenging the sufficiency of the complaint. While not disputing the facts of the case, a demurrer argues on the grounds that there is no legal claim even if the facts presented by the plaintiff are true. Thousands of civil cases are filed in the California’s sprawling court system which serves a population of more than 39 million people—about 12% of the total US population. In 2016, a total of 610,627 cases asking for damages over $ 10,000 were filed. State Government statistics show 95% to 96% of personal injury cases being settled pre-trial. Finding a jury or even a judge knowledgeable enough in Sri Lankan matters to rule on the cases against Rajapaksa will be particularly challenging, say experts. One of the cases has been filed by the International Truth and Justice Project (ITJP) based in South Africa and the US law firm Hausfeld on behalf of Sri Lankan-Canadian Roy Samathanam who claims he was tortured while in custody in 2007-2010 by a terrorism investigation unit reporting to the Defense Secretary. The second case has been separately filed by another organisation on behalf of Ahimsa Wickrematunge, daughter of journalist Lasantha Wickrematunge, assassinated in January 2009. Rajapaksa, widely expected to run at the presidential elections later this year, told Daily FT the lawsuits were a tactic to distract him and his supporters and that the charges against him would not stand up in a court of law. He added that far from being discouraged, he and his supporters would be more motivated by these tactics of foreign-based agencies. Rajapaksa was on a short visit to attend a wedding and spend time with his son who lives in the area. Process servers presented him with papers for the two lawsuits last on 7 April at a Trader Joe’s in Pasadena, about 10 miles northeast of Los Angeles. The city, at the foot of the San Gabriel Mountains, is home to a large number of Sri Lankan expats and houses the oldest Sri Lankan Buddhist temple on the west coast. In its press release, ITJP calls on other “survivors of torture” to come forward, expressing to possibly turn the ITJP’s lawsuit into “a class action”. A class is also a civil lawsuit, but brought by a group of people who are “similarly situated,” usually a group of people harmed in a similar way by a business entity. But Class actions are very complex and must first be certified by a judge before they can proceed. Newsin.asia adds: Meanwhile, the Sri Lankan media has been putting out reports that Prime Minister Ranil Wickremesinghe will be asking President Maithripala Sirisena to appoint Field Marshal Sarath Fonseka as Internal Security Minister with the intention of preventing Gotabaya Rajapaksa from becoming a Sri Lankan citizen and contesting the coming Presidential election. But sources close to Gotabaya said that this cannot be done because Gotabaya is already a Sri Lankan citizen. He is a citizen of Sri Lanka as well as the US, a dual citizen. When he is finally allowed by the US to relinquish US citizenship, he retains his Sri Lankan citizen. No government or minister can take away his Sri Lankan citizenship. The ruling United National Party and some sections of President Sirisena’s Sri Lanka Freedom Party are keen on preventing Gotabaya from contesting. The court cases in the US and threats of some hostile actions at home in Sri Lanka are seen as attempts by his opponents to keep him away from Sri Lankan politics and demoralize his followers.